Provident fund can be withdrawn before Retirement ??? Advance for buying a house or Plot – If you are looking to buy house from the promoter or builder then you are eligible to withdraw 36 months basic wages and Dearness Allowance(DA) or the total of employee and employer share with interest or the total buying price of the house, whichever is less. 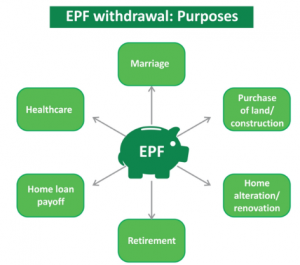 For this, an Individual should be the member of the EPF for at least 5 years and can withdraw the amount only once. Documents that you will require in this case will be Form 31 and a declaration form. Buying a site from agency and the payment is to be made to the agency – In this case you can avail 24 months basic wages and DA or the total of employee and employer share with interest or the total cost, whichever is least. All other conditions are same as above. For addition/alteration/improvement in house – If the payment is to be made to the EPF member then he can access 12 months basic wages and DA or the employee share with interest or cost, whichever is least. Repayment of Home Loan – If your purpose is to repay the home loan taken from Nationalised banks, registered cooperative society, etc. and the payment is to be made in favor of the bank then you can avail 36 months of basic wages and DA or the total share of the employee or the employer with interest or the total outstanding loan principal and interest, whichever is least. For this you should have the membership of at least 10 years. Documents that you will have to furnish in order to avail the amount is Certificate from the agency indicating outstanding principal and interest. Medical Needs – In case any salaried employee needs the fund for self or any family member’s treatment and the payment is to be made in favor of EPF member then six months of basic wages and DA or the employee share with interest, whichever is least should be availed. There is no membership required in such a situation. Documents required are Certificate C signed by Employer and Doctor. Education and Marriage Needs – If an employer needs the funds for the marriage of self/daughter/son/ brother/sister then he can withdraw 50% of the the employee share with interest . Membership period required for this is seven years. An employee can avail the facility three times and document required is Form 31. If you are looking avail funds for the matriculation education of son/daughter and payment is to be made through the cheque then 50% of the employees share with interest can be availed. Minimum membership required for availing the benefit is seven years and funds can be availed three times. A certificate regarding course of study and estimated expenditure from the head of the institution should be furnished.